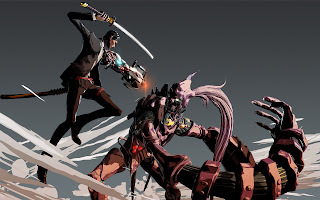 We all know Suda 51 for his quirky humour, stylistic gameplay and edgy, punk inspired titles, but did he succeed in creating yet another original and unique game? Or will Killer is Dead be destined for a place in the bargain bin? 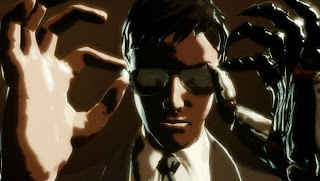 Killer is Dead throws you into the shoes of Mondo Zappa, an Executioner in a business suit with a suave and collected attitude, guaranteed to make almost any woman fall to their knee's before him. Much of the story can be summarised from the trailers. The object of the game is to execute anyone you've been contracted to kill, learning more about Mondo (your main protagonist) and the characters that surround him as you progress further into the game. In addition to this, every cutscene throughout the game seems to revolve around three key points - A woman by the name of Moon River, a man called David, and the actual Moon itself. It's not hard to see what's going on and you'll quickly find yourselves working things out around the mid-section of the game. Sadly, a big issue I found was that Killer is Dead could never quite work out if it was trying to portray itself as a funny, comical title or a serious game with a dark and menacing tone, and as a result, comes off as something quite awkward in between. Glasses make me look cool. For me, Killer is Dead felt like a Noir title with a cyberpunk edge, while Mondo himself came across as a serious, cold but compassionate ladies man of a killer. The dialogue spoken by him was mostly serious, but proving detrimental to this was the fact that every time you felt like you were adjusting to his character and getting a real sense of who he is, a comment breaking the fourth wall would be thrown out just for what seemed like the sake of it, ruining any immersion you might have otherwise felt. 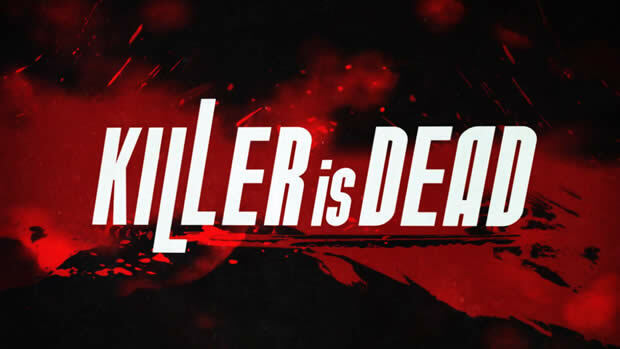 Needless to say, with a plot that doesn't really amount to anything spectacular, and forced dialogue that feels heavily out of context at times, the story of Killer is Dead feels like a massive, wasted opportunity, as ironically dead as those you'll face within the game. Story? Story is dead. The gameplay however, is something to behold. Aside from the unique and stylised visuals on offer here, the gameplay within Killer is Dead is fast, frantic and undeniably fulfilling. For me, the most rewarding aspect of the game was the dodge mechanic in synergy with the Burst Rush and dodge Burst features. Dodge Burst triggers when you dodge an attack that's millimetres away from hitting you, which in turn gives you a prompt to hit the square button; the results? An over-stylised flashy display of swift slashes from your Katana, as you race towards your target, unleashing a barrage of attacks to slice and dice whatever poor foe stands in your way. Burst Rush works in a similar way, except it allows you to skip the dodge step to simply charge at a stunned or weaker enemy, dropping them in one foul blow. Using this however, requires blood. So, what is blood anyway? Well to put it simply, blood is your main source of power throughout the game. It allows you to rush enemies, perform special attacks and is your only source of ammunition for your cybernetic arm/gun/drill/thing, Musselback. Needless to say, you'll find yourself relying on your own ability to siphon off your own blood, as you use your whole body as a weapon against the many enemies within the game - The Wires. The Wires are essentially people who've lost their way in the world and as a result, have fallen to their own sins, having now grown into dark, mindless, corrupted versions of their former selves. These are your main targets within the game and each one, whether faster or stronger than the last, have their own unique abilities and attack patterns for you to learn, counter and exploit. It may come as no surprise, but the Bosses you'll face in Killer is Dead, no matter how strange or obscure are simply stronger versions of the common Wires you'll face, with the only real difference being their stronger will and ability to cling onto the ambition and goals they held in life, maintaining traits of their original personality through nothing but their own indomitable spirit. As far as upgrades go, your Cybernetic arm (Musselback) can turn into multiple weapons ranging from a fully automatic Handgun, to a Drill and even a laser charged Railgun that's most effective at clearing enemies off screen. 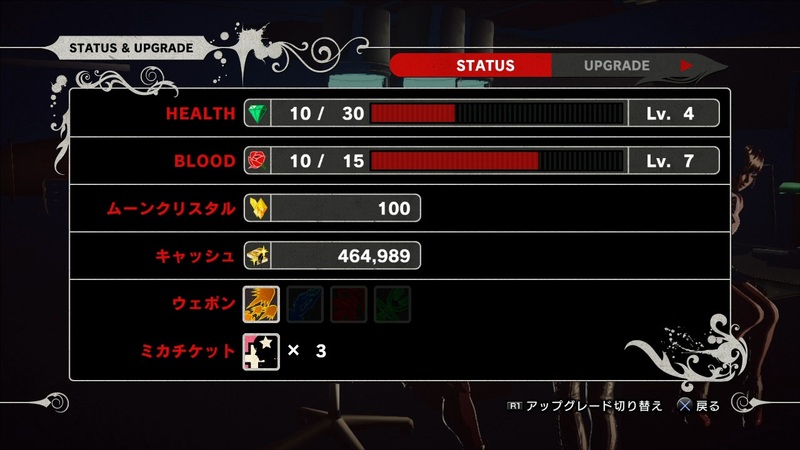 Damage output on these weapons can be upgraded, while your sword and even Mondo himself can be improved in a similar way. Some examples of what to expect in regard to upgrades consist of guard breaking strikes with the Musselback's melee function, a regenerative healing factor that you can upgrade to consume less Blood and heal faster, as well as several sword attacks that can be upgraded multiple times. 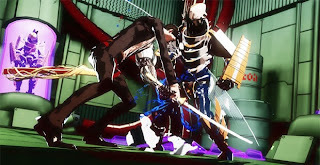 Killer is Dead's combat actions are rather limited, resulting in what can be described as a good game, but not a great game. There are only a handful of extra moves for Mondo's Katana and although you'll eventually have access to four or more Musselback weapons, most of these focus on ranged attacks; where as the primary focus of the game is on melee. I personally loved the combat, but without a jump button or any extra moves for the Katana (aside from an uppercut and spiral slash), all you'll find yourself doing is clashing with enemies, dodging their attacks and button mashing your way to victory. There is however, a mechanic which helps to keep things fun. The more you attack with Mondo's sword, the faster your follow-up attacks get. Now removing limiters in the upgrades screen help these attacks become quicker, so just imagine the feeling you'd get if you could jump, use aerial combat and have access to a whole series of flashy, stylish and over the top melee attacks. Sadly you can't and I feel this was a waste of potential to build upon a great idea here. That's not to say the gameplay is bad however, because it’s still pretty fun and the varied types of enemies help to keep the adrenaline flowing, while your response time needs to be incredibly accurate to dodge and parry every type of enemy attack in order to show off Mondo's flashy and energetic combat finesse. Now, before I delve into the artistic gratifications of the game, something in particular that I've been dying to speak of are the boss fights. Although cool and sleek in design, virtually every boss you'll encounter over the course of the game fails to come across as engaging and the only thing I could put it down to was the speed of which you can kill them. The final boss is a slight exception to this, but 99% of the bosses within Killer is Dead lacked climax and more often than not, needed to be dragged out more, if only so you could better appreciate their design and actually feel challenged by the ferocity their imagery portrayed. What I do like however, is the amount of unlockables and replay value Killer is Dead has to offer. Within each level is a woman called Scarlette who hides in boxes and other locations where you might not normally think to explore, but upon finding her, rewards you with extra missions within the games optional battle arena. Each mission within this arena challenges you to defeat all enemies under specific conditions which change with each challenge. On top of this, there's an in-built "New Game+" system that allows you to jump between difficulties and replay any previous mission to better your score and discover every secret each level has to offer. There are also multiple costumes to unlock, one of which is quite possibly one of the coolest costumes ever to be featured within a game. Only Suda 51 would put something like this is a game. You can also visit "Mondo's Girls" where you're tasked with dating women, showering them with gifts (but only ones they'd appreciate) and even ogling their assets while they're not looking, which for some reason wins you their heart and a whole night full of fun. Sadly though, this kind of objectification prompted only a few schoolboy laughs from me and offered no real value to the game, portraying Mondo as more of a womanising sleeze than a cold-hearted killer. Visually, Killer is Dead is a stylistic masterpiece. 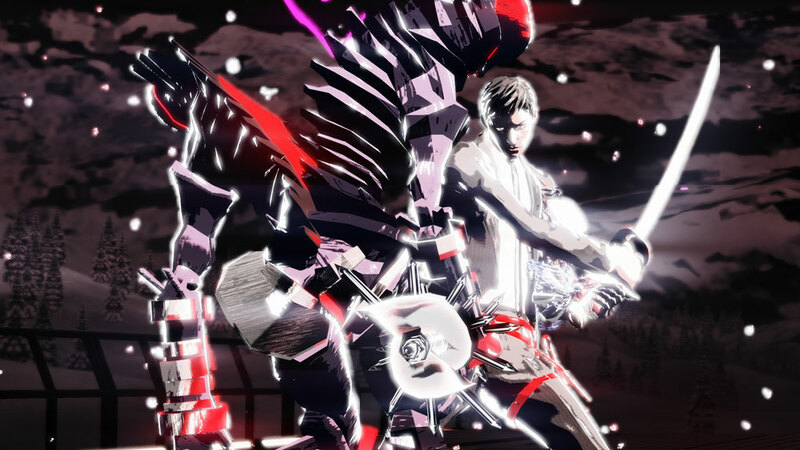 With shades of blue that appear almost luminescent, black and white slow motion speed kills contrasted by the vibrant red of enemy blood and literal ghosting effects from Mondo's incredible agility gives Killer is Dead a very unique art style, and is something akin to Killer 7 and No More Heroes' cel-shaded visuals...only with nicer textures, a higher resolution and a far crisper design all around. Put yourself back together man. The sound itself needs a lot of work. The issue I found wasn't that the soundtrack was bad or even uninteresting, but more a problem with the sound balance itself. The soundtrack is ambient and atmospheric when it needs to be and some of the songs within the game are quite catchy, but as soon as combat initiates, the game’s OST is quickly drowned out and ruined by the overpowering sounds of each gunshot and attack within combat, leaving little to no lasting impression. As a long standing fan of Suda 51, I had high hopes for what looked to be an exciting and interesting title worthy of the Suda 51 name. However, after a lengthy amount of time spent with Goichi and Grasshopper Manufature's latest title, the impression I got was that although the gameplay was fun and the stylised graphics of the title were both unique and refreshing, some missions felt more like a chore than anything fun. The 4th wall breaking comments accompanied by a very poor story has now pressed uncertainty upon me with regards to Suda 51's story-telling capabilities in this "button mashy" and at times, two dimensional game. I wrote this article some time during early August based on my experiences with the import version of the game. Originally, I simply wished to explore some its overall themes albeit in a rather comprehensive and lengthy fashion. 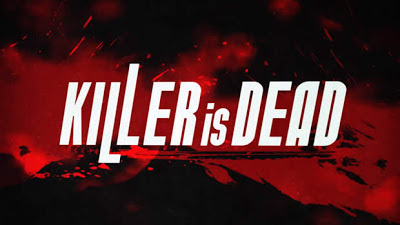 However, set within the context of being released so closely and concerning subject matter of considerable consternation to the less favorable reviews of Killer Is Dead, it has incidentally become, with little to no alteration to the original material, a defense of the game's creative and structural decisions. To summarize, it explores the thematic significance of the Gigolo Missions, how they establish Mondo's character arc, and manner in which the game's story isn't so much simple as it is understated. These are the impressions and conclusions I drew from playing the game and hopefully it provides an intriguing and fresh perspective on it for you apart from the more cynical criticisms out there.